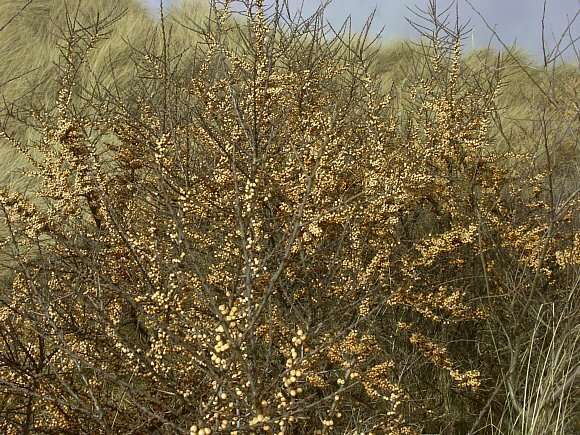 Spreading into thickets amidst coniferous trees on old sand dunes by suckering. The shrubs wear the orange berries like sleeves close to the branches as if covered in a lichen. 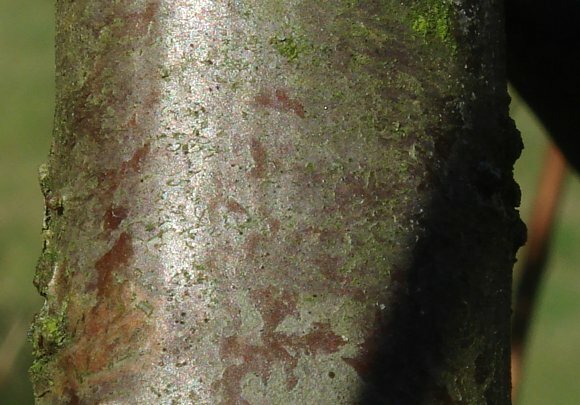 Narrow lanceolate leaves still wet from recent rain with silvery scales on underside (centre bottom). Berries ripening. Leaves still wet from rain. Berries strung and closely held to shoots. The thorns are not very numerous. The berries a strident orange; skin pitted in almost regular intervals. The trunk of a mature specimen. Autumn and the well-faded pale yellow berries are probably by now hollow. All leaves gone. A newish plant growing amongst beach stones and above the drift line. The flowers of a female plant. 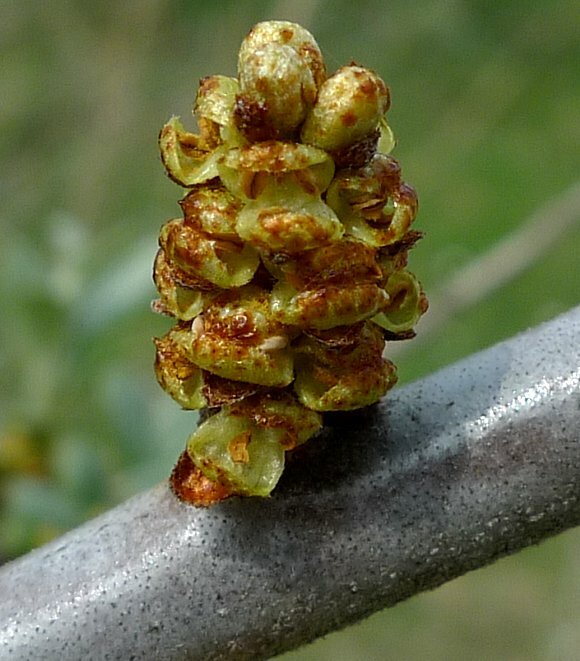 The petal-less greenish yellow female flowers on a female plant. A male bush in flower; the flowers being almost as bright an orange colour as the female bushes in berry. 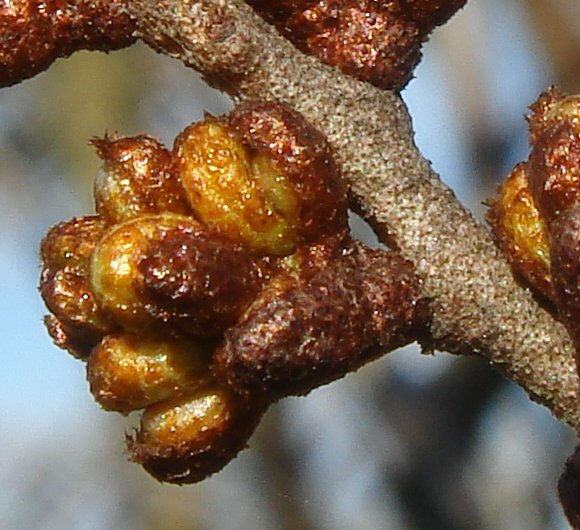 The male flowers are orange-brown and on separate trees from the female flowers. 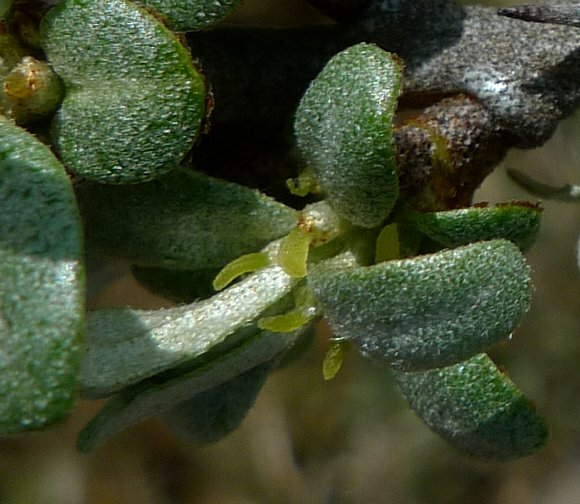 Male flowers on a male plant. The petal-less male flowers start to open. They are larger than the female flowers. The male flowers may have leaf buds growing from the top. 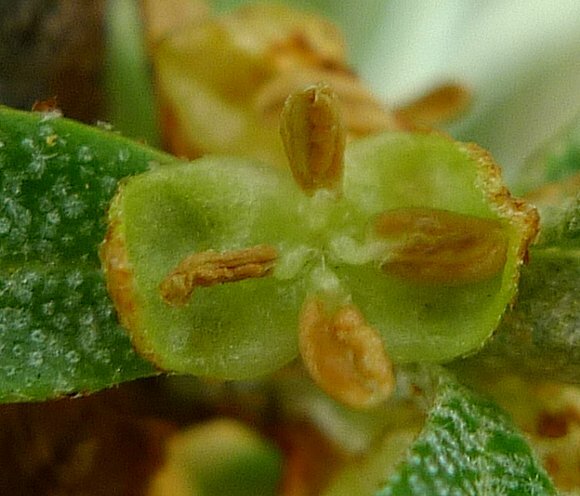 Here most of the sepals enclosing the anthers have opened, displaying the anthers bearing pollen within. The four stamens of a male flower between the two opened light-green clam-like sepals. Now the two sepals are open wide where four anthers reside bearing pollen. The orange container, being the male flower, split wide open, bearing four anthers. 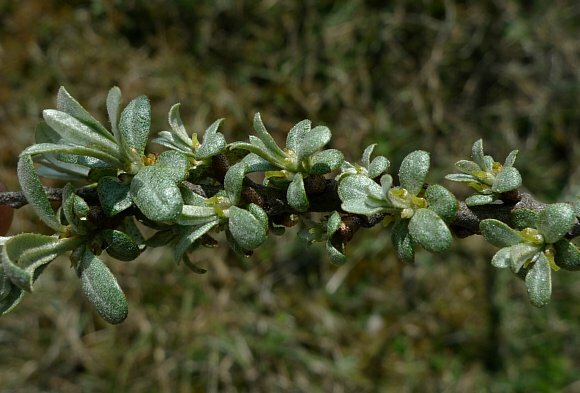 Some branches bear extremely long and sharp spines, resembling those of Blackthorn (Sloe). Some similarities to : Pyracantha , in that both have orange berries. 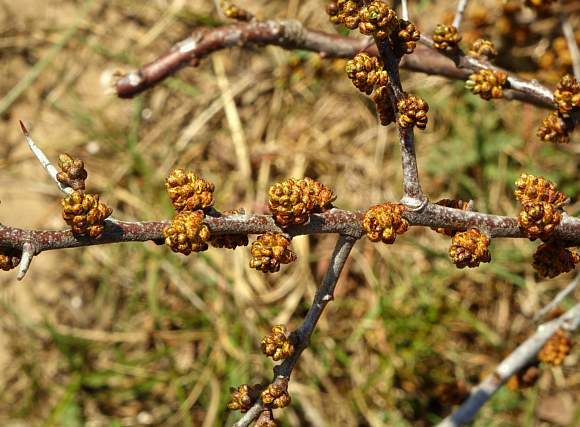 Not to be confused with: Blackthorn [a shrub or tree with similar name, which produces fruits called Sloe berries]. 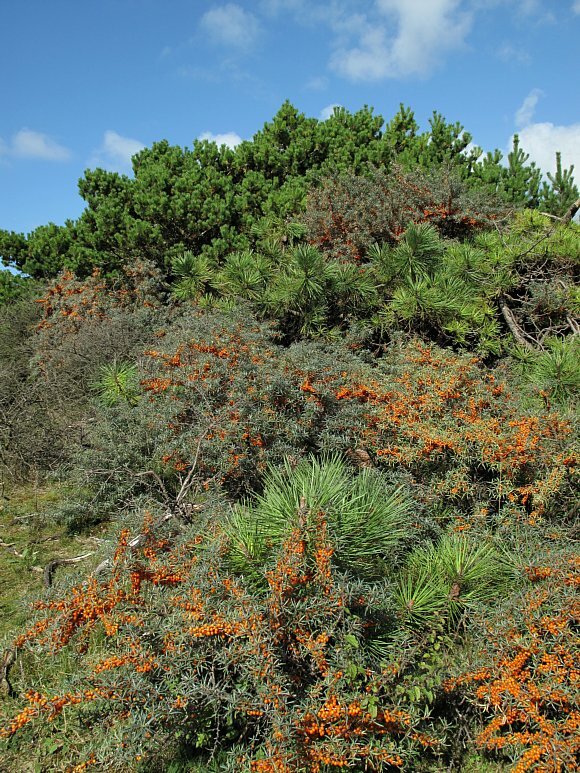 Sea-Buckthorn is native at seasides and stabilises the sand-dunes, but is usually planted inland where it is now becoming a problem throughout Britain, for it spreads by suckering producing thickets that prevent other plants from growing. 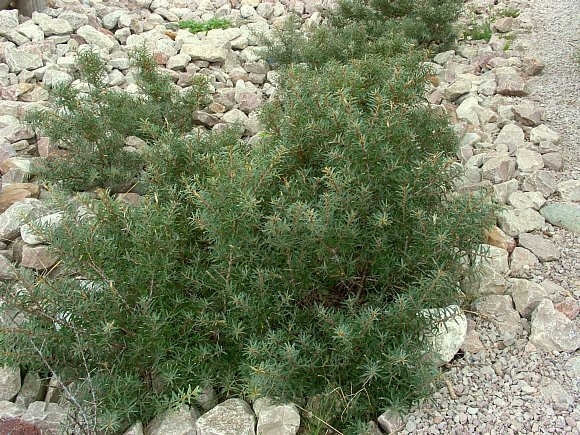 Like most sea plants, it is salt tolerant both of salt-laden sea spray on the leaves, and of salt within the ground. 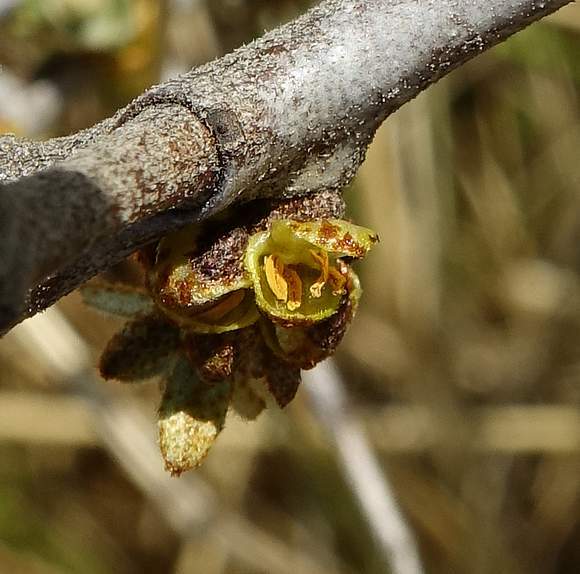 The tree bears very small petal-less flowers in early spring mostly before leaves appear (although this can vary, it seems), and on last years new growth. 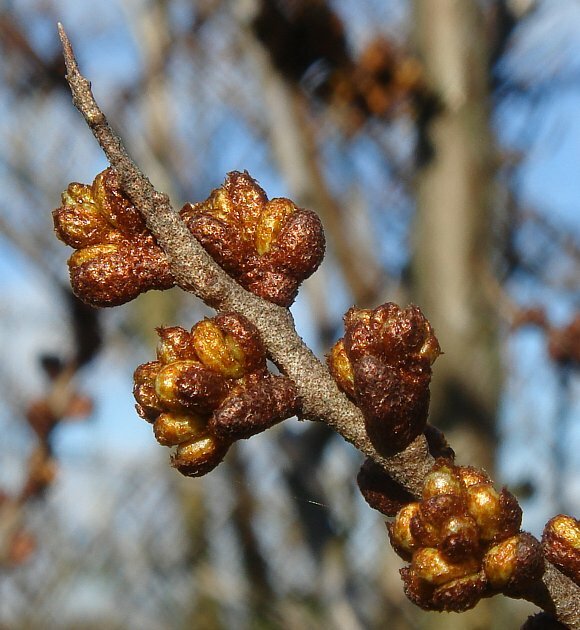 It is dioecious, with separate male and female flowers on separate trees; the male flowers being very small, bud-like, orangy-brown and clustered together. 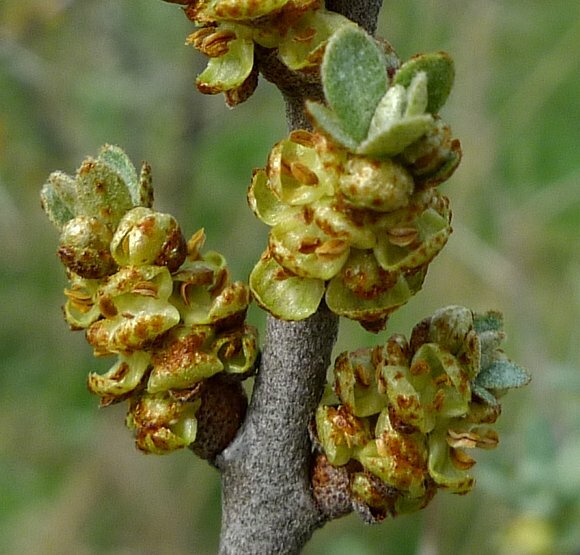 The female flowers are even smaller and much less conspicuous, and are a yellowy-green. The flower clusters often grow in the thorn or the leaf axils ('armpits'). The orange berries appear on female plants only, and are present with the leaves, which are long and narrow, slightly curved backwards, and greyish-green with pock-marks. 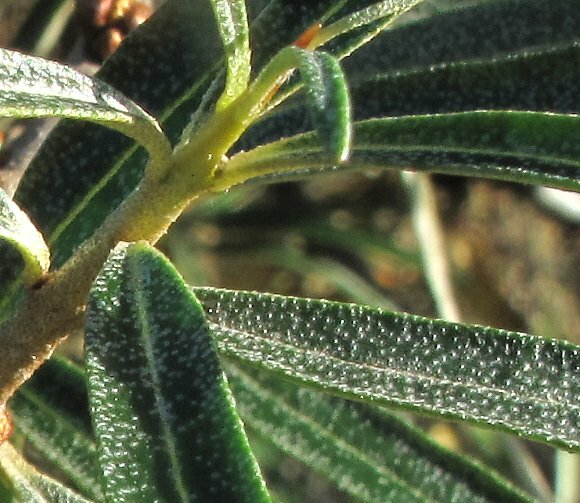 The leaves have silvery scales on the underside. The berries are very high in Vitamin-C, with about a 10-fold greater concentration than that in oranges. The juice from the berries contain a multitude of nourishing compounds, but more remarkable still is that the freezing point is -22 Celsius, remaining liquid even in domestic freezers. The berries are astringent and too bitter to eat raw (too bitter for most birds too), but after bletting (being frozen for a few days) they can be eaten, but are better used to make jams, pies and liquors. The bitter component is Malic Acid and it is this rather than the huge quantities of Vitamin C (aka Ascorbic Acid) which give the berries an astringent taste. But the glycosides of isoRhamnetin especially that of isoRhamnetin-3-O-Sophoroside-7 also contribute considerably to the astringency, but the dimers and trimers of ProAnthoCyanidin and Quercetin Glycosides have less impact. 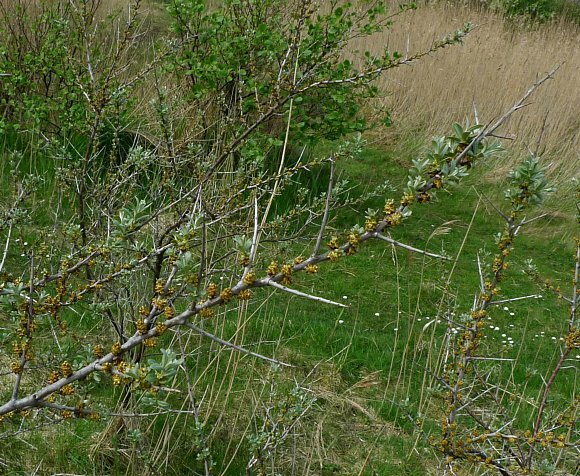 The long sharp spines on Sea-Buckthorn make manual picking of berries a very hazardous process (like picking sloes off Blackthorn is), so it is commercially harvested by a machine cutting off the branches, freezing them, and shaking off the frozen berries. This freezing of the berries is part of the bletting process to make the berries palatable. 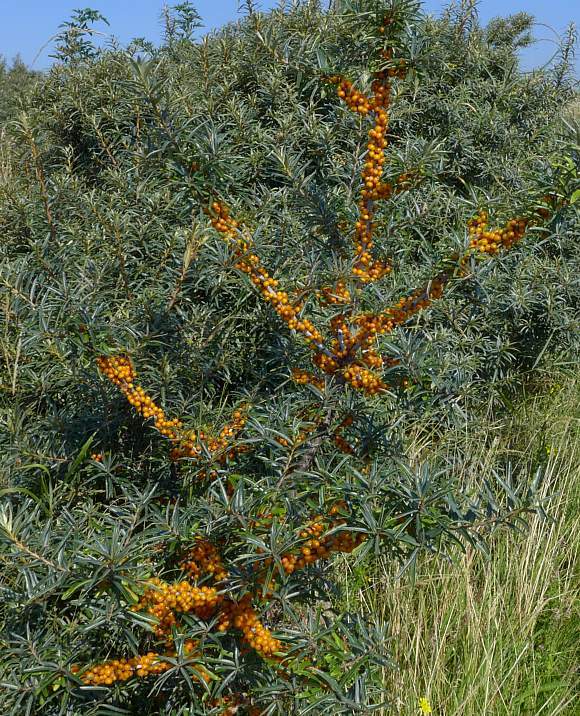 Sea-Buckthorn is native in some eastern parts of England such as Norfolk, but on the western sand-dunes it is a highly invasive plant capable of spreading rampantly to the exclusion of other plants. 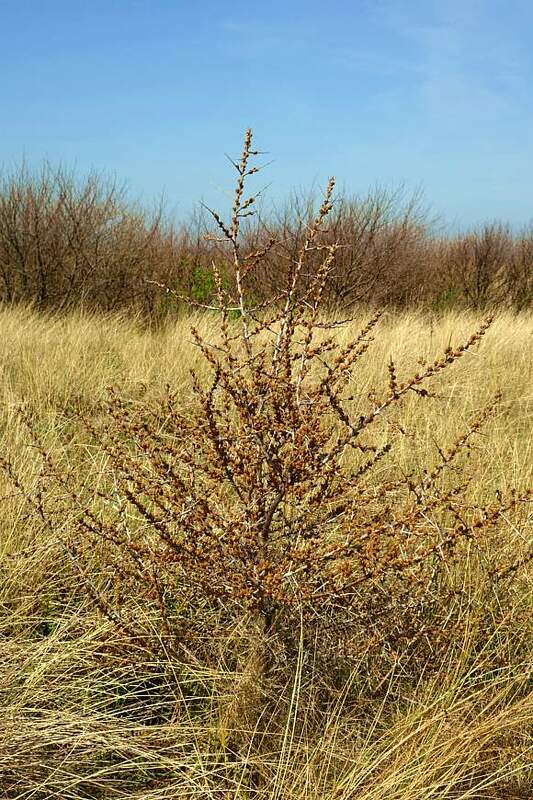 This is especially so on the Sefton Coast where removal is the only remedy, but this is a slow process and the Sea-Buckthorn can seemingly spread faster than the volunteers can dig it up. It quickly covers paths making them impassable, so pliers of these paths make new paths around the Sea-Buckthorn. In its native areas it exhibits no such rampant behaviour. 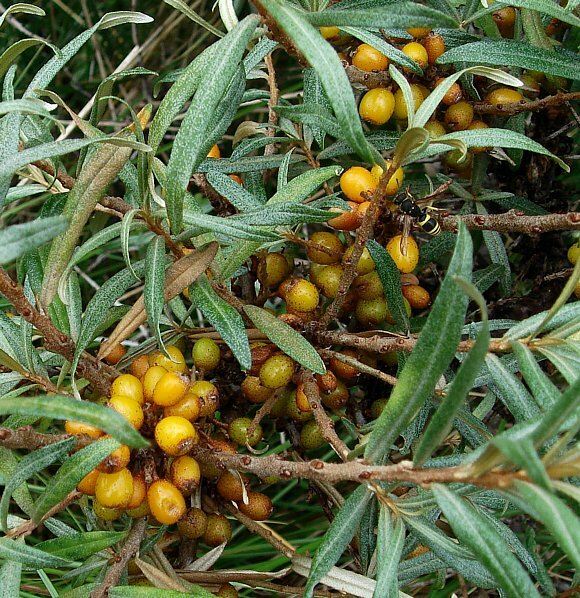 An oil, sea-buckthorn oil, can be obtained from the seeds. It is particularly rich in plant Phytosterols Tocopherols and Tocotrienols, as well as especially high levels of Carotenoids. It also contains up to 65% fats in the form of both the mono-unsaturated fatty acid Palmitolic Acid and the saturated fatty acid Palmitic Acid. Sea-Buckthorn oil is used to treat radiation burns to the skin caused by over-exposure to nuclear radiation, and also as a preventative to reduce the effects of ultraviolet radiation (to which it is opaque) when astronauts are working in outer space on orbiting satellites. 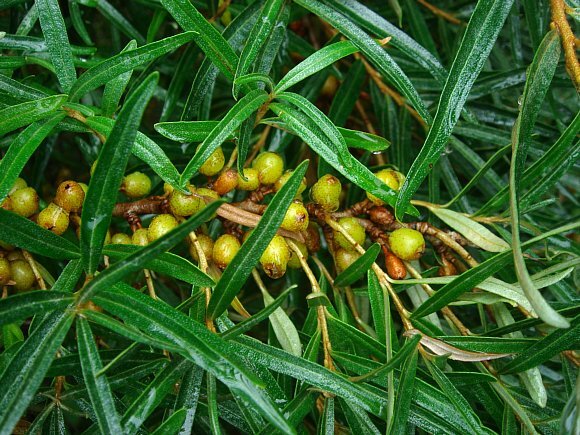 It is used for a variety of other skin conditions including acne, eczema, etc. 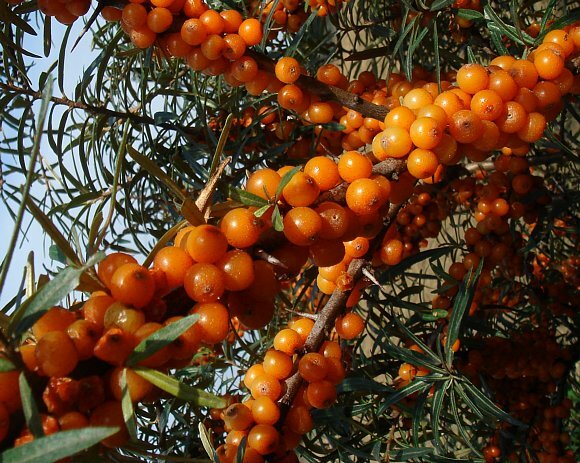 Sea Buckthorn is one of the few plants, and even fewer trees, that can fix nitrogen via symbiotic bacteria (Actinomyces) in the roots. 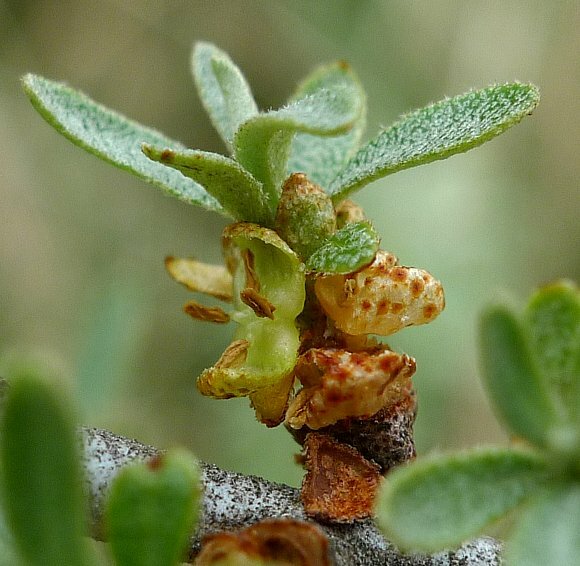 Most of these so-called Actinorhizal plants are members of the Pea Family (fabaceae), the exceptions being mostly shrubs and trees from diverse other families. Over 18 families of plants can manage this feat, amongst them Salviniaceae and Water Fern ( Azolla filiculoides ). 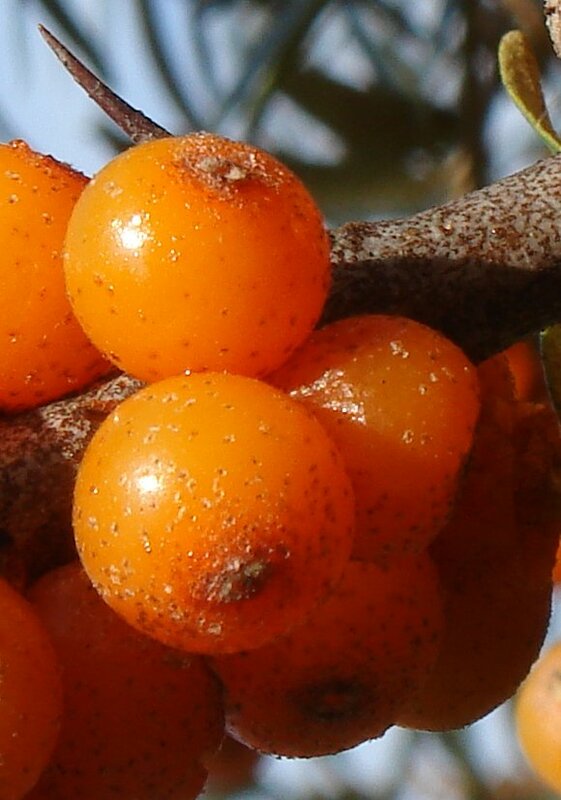 A yellow dye can be extracted from Sea-Buckthorn. One of the main colour components of the berries are carotenoids, amongst them Carotene, Lycopene , Xanthophyll, CryptoXanthine , Zeaxanthin. 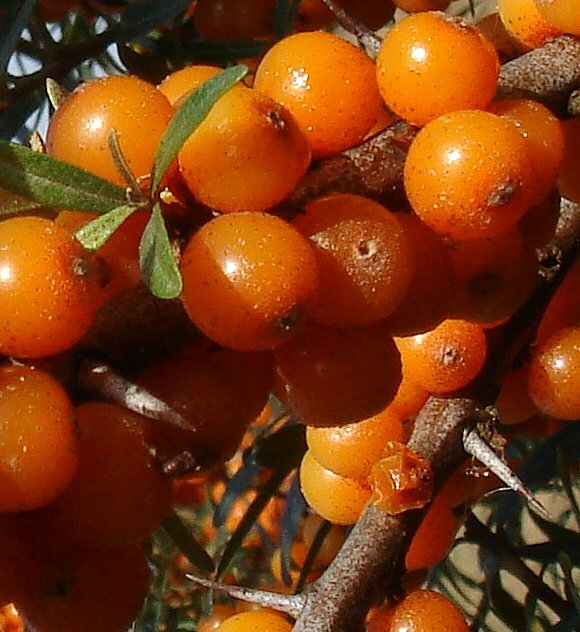 Sea-Buckthorn berries also contain the phytosterol β-Sitosterol .